One (the actress) and one (Janis Joplin) inexorably makes two. This song became an audition. There will ever be a selection to choose the role of Janis Joplin in a movie, Juliette Lewis has the moves, the voice, the experience all on her side. She is clearly far too pretty for Janis’role but Hollywood make-up can make miracles, can’t it. The part is hers, I am sorry for the singer wannabe actress, Alanis Morissette, but there is no contest here. Mr Oliver Stone take note, please. More sports and some extraordinary synergy in evidence with the Da Silva twins who are young footballers just starting to make an impact in the game. 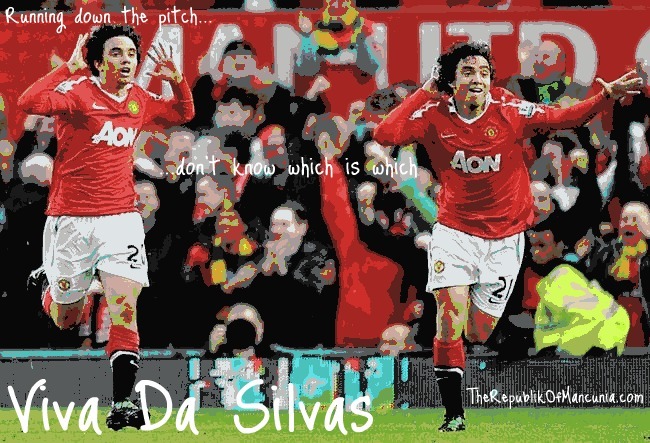 Rafael's scored twice for United; the first away against Arsenal and his second at home against Wigan. Fabio's also scored twice; the first away against Wigan and the second at home against Arsenal. Rafael, who usually plays at right-back, scored both his goals with his left foot while Fabio who usually plays at left back, scored with his right foot. The twins' goals against Wigan were scored in the goal to the left of the dug-out of either ground while their goals against Arsenal came in the goal to the right of the dug-out. Looks like Nicolas Cage has either been around for a while (as a vampire) or is also (re)incarnated, but great likeness (too good) and you can buy the photo on e-bay for a cool million!! 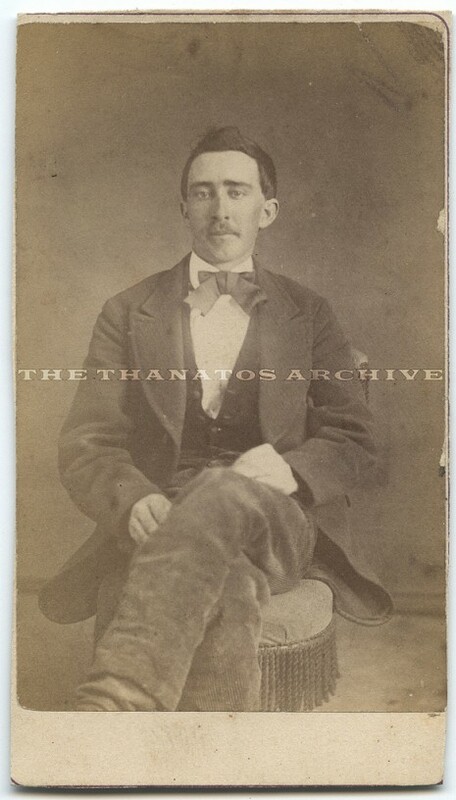 Original c.1870 carte de visite showing a man who looks exactly like Nick Cage. Personally, I believe it’s him and that he is some sort of walking undead / vampire, et cetera, who quickens / reinvents himself once every 75 years or so. 150 years from now, he might be a politician, the leader of a cult, or a talk show host. This is not a trick photo, it’s an original photograph of a man who lived in Bristol, TN sometime around the Civil War. Q: Nick Cage has aged terribly in the past 10 years, he’s obviously not been drinking his daily amount of blood to stay young. A: My theory is that he allows himself to age to a certain point, maybe 70, 80 or so, then the actor “Nicolas Cage” will “die”... but in reality, the undead vampire “Nicolas Cage” will have rejuvenated himself and appeared in some other part of the world, young again, and ready to start all over. From time to time somebody might mention to him that he bears a slight resemblance to the young version that dead American actor, whose name they can’t recall, but eventually, those occurrences will stop altogether. No official word yet on whether this is photoshopped. Cage is one of the only talented Hollywood actors IMHO. and has given some of the worst performances of all time. she revealed her baby is due on her late mother's birthday. and touching and just really beautiful. I was so happy. to let me know that she's watching over me and my baby." Being reborn on the same birthday. Cool. They only function when open. Do you see much of your father in you? "Quite a bit… I was born on his birthday. weird when I would sit and talk with him. did just like me." Such as? "Idiosyncratic things. Born on the same day, eh? Another multi-incarnation playing out? who is suspected of playing a role in the JFK assassination. I've read that Harrelson's father was a contract killer but assume it's an urban myth – one of those apocryphal stories actors come up with when bored. I ask him how he got on with his father. ......He tells me a bit more about his father. "I think they separated when I was seven. But he was gone a lot before that, in prison. Away and back. Away and back. It wasn't like he was there all the time prior to that." "They call him a contract killer in the cuttings," I say. "Is that a glamorisation or simplification of what he did?" Harrelson chews some more on the imaginary tobacco. "Yeah, I mean that's probably a fair, erm…" He stops. Fair job summary? "Yeah, job summary. I was 11 or 12 when I heard his name mentioned on a car radio. I was in the car waiting for a lady who was picking me up from school, helping my mum, and anyway I was listening to the radio and it was talking about Charles V Harrelson and his trial for murder and blah blah blah blah and I'm sitting there thinking there can't be another Charles V Harrelson. I mean, that's my dad! It was a wild realisation. Then the woman got in the car and saw my face and realised something was up. She was a very kind lady." He says he went home, in shock, and tried to talk to his mother about it. But there was little to say – the truth was out there, on the radio and in the papers. Did your mum know what he did for a living? "Oh yeah, she was pretty hip to all that." Did she love him? "Well, no, she was well out of love with him. You know, I've got to give her credit because she never really soured us on him, she didn't talk negative about him, never, ever. And she could have – he wasn't the greatest husband. Or father. But..."
Charles V Harrelson was jailed in 1973 for the murder of grain dealer Sam Degelia Jr. He was sentenced to 15 years, but released after five for good behaviour. In 1981 he was given two life sentences for the assassination of district judge John H Wood – the first murder of an American judge in the 20th century. At times, he also claimed to have assassinated John F Kennedy. It was in 1981, after he heard his father had been arrested for killing the judge, that Woody tried to get in touch with him, aged 20. Were they ever reconciled? "Oh yeah, oh yeah. I tried for years to get him out. To get him a new trial." Why did you think he deserved a new trial? Harrelson stops, and thinks about it as if for the first time. "I don't know he did deserve a new trial… just being a son trying to help his dad. Then I spent a couple of million beating my head against the wall." A couple of million, I say, astonished. "Easily. Lawyers upon lawyers…"
Do you see much of your father in you? "Quite a bit… I was born on his birthday. They have a thing in Japan where they say if you're born on your father's birthday, you're not like your father, you are your father, and it's so weird when I would sit and talk with him. It was just mind-blowing to see all the things he did just like me." Such as? "Idiosyncratic things. The way he laughed. The face, very similar." Did it scare you that you were so similar? "No, no." He laughs, uncertainly. Do these conjoined twins share consciousness? 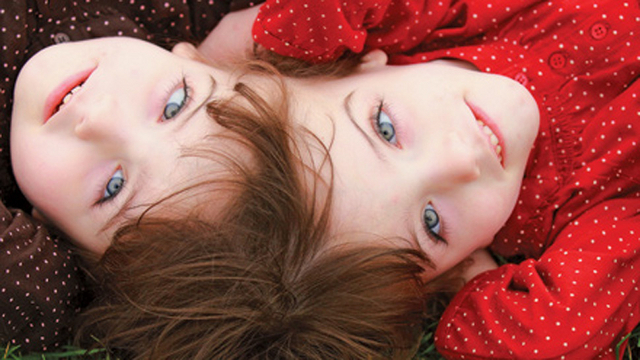 Susan Dominus has penned a remarkable piece for the New York Times about Krista and Tatiana Hogan, the 4-year old conjoined twin girls from British Columbia who are attached at the head. Scans show that the two girls have brains that are interconnected by a never-seen-before "thalamic bridge," an indication that they might share conscious thoughts. And if their early behavior is any indication, this may very likely be the case. Twins joined at the head, what's referred to as craniopagus in the medical literature, are extremely rare occurrences, affecting only one in 2.5 million births. Most don't survive. But the Hogan twins are an even rarer case yet. Their neural anatomy is something that has never been seen before by scientists: their scans reveal an attenuated line stretching between their two brains connecting each of their thalamus together. What makes this observation particularly interesting is that the thalamus happens to be a kind of neural switchboard, a two-lobed organ that filters most sensory input. It's also thought to play an important role in the rise of conscious awareness. Thalamic nuclei have strong reciprocal connections with the cerebral cortex, forming neural circuits that are thought to be involved in consciousness. The thalamus also plays a major role in regulating arousal, levels of awareness, and activity. at various times during the 1920s and 1930s using vehicles called Blue Bird. holding both land speed and water speed records. 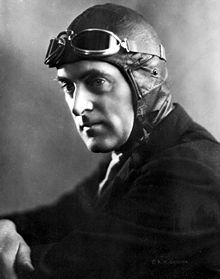 Malcolm Campbell began breaking the land speed record in 1924 at 146.16 mph. By 1964, as Donald Campbell, he was setting a land record of 403.10 mph. After all, if you're good at something, keep at it! (23 March 1921 – 4 January 1967) was a British speed record breaker who broke eight absolute world speed records in the 1950s and 1960s. He remains the only person to set both world land and water speed records in the same year (1964). with little change in physical appearance and expression of that talent. This innocuous photo and story was posted by Bri back in 2011.
that was taken in 1864 at Johnson's Island prison camp in Ohio. the leader of a cult or a talk show host." So the old photo is Lt. G.B. Smith, Bristol, Tenn. a Confederate prisoner. a name very similar to that, but from a different and much later war. of the T.C.B.S., but not until after Vincent Trought's death. He was at that time already enrolled at Corpus Christi College, Oxford, close to Tolkien's Exeter College. The two became close friends there, because most other Edwardians went to Cambridge. Smith joined the 19th Service Battalion of the Lancashire Fusilliers, the "3rd Salford Pals", and participated in the Battle of the Somme. He was hit by shrapnel on November 29, 1916, and died four days later -aged 22.
you feel, and all the three other heroes feel, how impuissant it is. to say them, if such is my lot." which is a sound-alike for one of the "immortal four". Perhaps Mr. Cage is indeed multi-incarnate. And shows up at key points.